After 10 months of writing, rehearsing, and filling our knickers with whiff gas we finally return triumphant from our first gig in London. Yes, #RikCon2016 is over, we rocked the capital (or at least gave it a gentle shake), and we’ve got video to prove it! We’ve been sat on this news for a little while, but we can at last make the official announcement that we will be appearing live, playing a song or several, at the second annual Rik Mayall Convention in London, on April 23rd 2016! 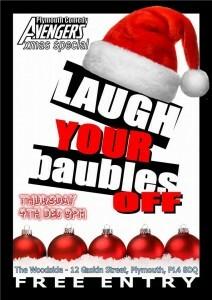 If you’re in the Plymouth area on December 4th, you might want to come down to The Woodside on Gasking Street at 8pm as we, along with a number of other mirth-mongers, will be playing Plymouth Comedy Avengers’ christmas show!